This three stars hotel Brixen is located in a smaller historical building in the city centre of Prague. The hotel was recently reconstructed and also all its rooms were refurbished. 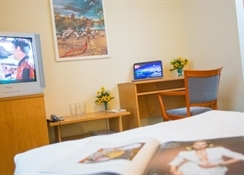 Hotel is suitable for all who is looking fro the accommodation in a smaller hotel with the friendly and family atmosphere in the walking distance o the centre of Prague, for all people who love shopping, culture and nightlife. Hotel offers rich breakfasts and service of coffee bar, with wide menu of hot and cold drinks and simple refreshment. Matter of fact is an acceptance of all common credit cards, exchange, copying, fax, car park,purvey of tickets for culture events, laundry or taxi service ... A guide or an interpretor is also provided for our clientage. Hotel Brixen is situated in the centre of Prague, only 10 minutes walking from the famous Wenceslaw Square - the centre of cultural and business live of Prague. The nearest metro station, I.P.Pavlova is only 2 minutes away. Ideal for those looking for comfort at exceptional value in a strategic downtown location. All interesting places of Prague are in walking distance from the hotel. Hotel offers for the clients the accommodation in 28 clean and cozy, newly reconstructed and newly equipped rooms (double/twin). All rooms are equipped with TV/SAT, minibar, phone and separate bathroom with toilet. 8 rooms have the possibility of 2 extra beds (for maximum 4 people). 8 rooms can be interconnected. 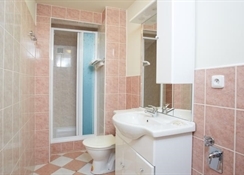 Rooms capacity, with the possibility for a short or long lease of office facilities, is in this allocation: 4 single-bed rooms, 24 double-bed rooms, 12 extra beds.